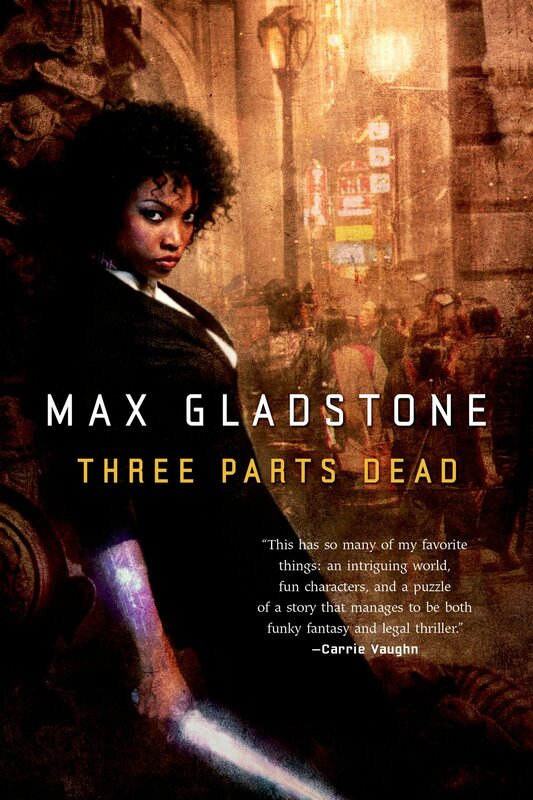 Three Parts Dead, the first volume of Gladstone’s Craft Sequence, is a good book, a clever book, a beautifully written book. On some occasions it rises to greatness. On other occasions I thought it had some problems. There’s more good than bad, and I would certainly recommend it, albeit with some very minor caveats. The main protagonist (one of a handful of POV characters) can best be described as a lawyer-wizard. Gods are defined by the legal contracts that allow others to draw on their power, and the plot revolves around the sort of machinations one might imagine would spawn from that. The setting is bizarre and wonderful, a steam-punky urban fantasy realm with gargoyles, vampires, gods, priests, wizards, and a few things that defy easy description. It feels unique in a way that’s hard to achieve. But it’s also confusing. Gladstone circles around some core world-building concepts without offering anchors, so I spent a great deal of time wondering if I really understood what was going on. Even so, there’s some gorgeous spectacle here. The characters are a bit hit or miss. Our protagonist, Tara Abernathy, felt to me more defined by her (very cool) backstory than her actions in the book. She didn’t have much of an arc, but felt more like a Plot Mover and Explainer. But I loved her boss, the unflappable Elayne Keverian, and her sidekick, the hapless God-fearing technician Abelard. And the main villain of the book was extremely entertaining, despicable without being a conventional Bwa-Ha-Ha sort of bad guy. My main beef with the book was its magic system: the Craft, after which the series is named. It was fascinating, but both ill-defined (intentionally, I believe) and constantly central to the plot. As a result, there seemed a number of clashes between magical forces where the outcome seemed arbitrary—as though the author needed someone to win, or escape, or discover something, and happened to pull out just the magic gobbledygook that was needed right then. The Craft is at the heart of everything that happens in the book, so I would have liked it to have more consistency. On a positive note, the plot itself is extremely clever, full of foreshadowing, and I loved how the author wrapped up everything at the end. There was a lot of “Oh, now that makes sense!” head-slapping for me as a few consistently mentioned but seemingly unimportant details became central to the story. The book has no end of creativity, the writing is top-notch, and there’s a good balance of action and mystery. I’m putting it in my “liked it but didn’t quite love it” category, but it’s easy to see how someone could absolutely adore it.